With the variety of medical careers available, future professionals in this field can spend a lot of time researching questions such as, “What is a nurse anesthetist?” As one of the areas of the medical professions that is gaining in importance and demand, nursing professionals and future nurses might consider pursuing further education in anesthesia administration. A nurse anesthetist is an integral part of many of the procedures and processes that area performed in physician offices, hospitals, care facilities, and other medical settings. A nurse anesthetist administers, monitors, and manages the anesthesia given to patients. In some settings, nurse anesthetists are the only providers of anesthesia, and in other settings, a nurse anesthetist is part of an anesthesiology team, which typically includes an anesthesiologist. Additional information on the role of the nurse anesthetist in various medical environments can be found at the American Association of Nurse Anesthetists website. Anesthesia is administer for a variety of different reasons, and a nurse anesthetist is qualified to provide this part of required medical care throughout these operations. Nurse anesthetists might work in hospital operating rooms, critical care or emergency rooms, obstetrical delivery rooms in hospitals or birthing centers, in ambulatory service centers, and in physician offices. In addition, nurse anesthetists are an important part of the operations and procedures that are performed in the offices of ophthalmologists, plastic surgeons, podiatrists, and dentists. In large hospital or urban settings, a nurse anesthetist is most likely to work in a team. However, in rural environments, a nurse anesthetist is most likely to be the only anesthesia care provider in any medical setting. 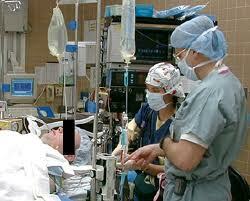 Nurse anesthetists also are the main source of anesthesia administration in each branch of the military. To begin a career as a nurse anesthetist, future professionals must complete a bachelor’s degree, typically in nursing, and licensing requirements will necessitate completion of a Registered Nurse program. After, future nurse anesthetists will complete a master’s program in nurse anesthesia from an accredited institution. Nurse anesthetist students complete a number of different courses throughout the graduate education. Examples of common course work include principles of anesthesia, pathophysiology, pharmacology, pain management, health assessment, and health care leadership. Students will also complete anesthesia courses specific to particular areas of medicine, such as pediatrics, obstetrics, and geriatrics. To successfully complete a graduate program, nurse anesthetists will also complete several clinical practicum hours and seminar courses. In addition to a bachelor’s degree, nurse anesthetists must hold a valid Registered Nurse license, have completed an accredited nurse anesthetist program, and must have successfully passed the nurse anesthetist national certification examination. Additionally, individual states may require further completion of qualifications for issuing a license to practice as a nurse anesthetist. From what size city to live in to what type of medicine to work in, a nurse anesthetist has diverse options. After determining the answer to the question what is a nurse anesthetist, future professionals in this field will have a start to finding a position to match experience, education, personal interest, and goals.